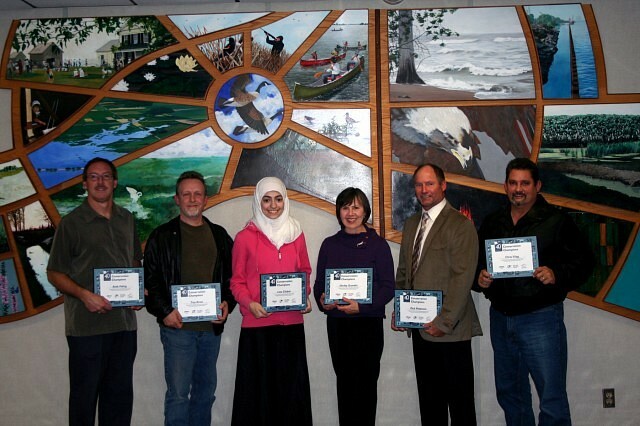 The Essex Region Conservation Authority honoured six individuals as Conservation Champions at their November Board meeting. Lina Chaker is a second-year student at the University of Windsor. While still in high school, Lina initiated a community composting program in her South Windsor neighbourhood that benefits the community garden on Drouillard Road. Through her role heading the Outreach subcommittee of the Windsor Islamic Association (WIA), Lina focuses on projects that reach out to and benefit the wider community and focus on environmental issues. She has organized clean up days at the mosque, and also took a lead in recruiting participants for a walk-a-thon at Devonwood Conservation Area, with proceeds benefiting our Conservation Foundation’s Trail On! campaign. Lina is also a member of ERCA’s Youth Engagement Strategy (YES) Team, and was the recipient of a 2012 Conservation Award for Youth. Rick Paterson is a professional engineer who has continuously demonstrated a high level of proficiency in his field of civil engineering and continues to work tirelessly for his client base throughout the Essex Region. In his early career, Rick was involved in modelling shoreline structures to ensure that the design would stand up to the rigours of the coastal environment while at the same time ensuring that the proposed structures would not adversely affect environmental features. He has authored or been involved in the teams that have completed a significant number of shoreline management plans, and has participated on many site specific coastal and riverine investigations and studies. He has also donated his time and professional skills in designing and certifying such structures as the viewing towers at Petite Cote, Tremblay Beach and Ruscom Shores Conservation Areas. Rick and his firm, CSI Engineers go to great lengths to incorporate environmental enhancements and environmental mitigation techniques into all of their designs. Shirley Grondin has been an active member of the Friends of Turkey Creek for close to 10 years, and has been a dedicated participant in cleaning up the creek and tending to the native plant garden. Shirley has also been a member of the Essex County Field Naturalists Club since the mid-1990s, and is part of the team that works tirelessly in maintaining the Shaughnessy-Cohen Woods on Pelee Island. She has been a member of the Friends of Ojibway since its beginning in1993. She also devotes her time and expertise to a wide variety of citizen science monitoring programs, including Frogwatch, Marsh Monitoring Program, Christmas Bird Count, annual butterfly count, Breeding Bird Atlas, etc. In her spare time, Shirley is an avid hiker, birdwatcher, kayaker, and canoeist. Andy Paling has been a leader of the Friends of Canard River for close to 15 years. In fact, he was one of the group’s founding members, and continues to generate enthusiasm and excitement for stewardship among his fellow members and across the watershed. Andy has also shared his keen interest in the natural world with his students at St. Thomas of Villanova High School for the past 25 years, with a teaching focus in horticulture, environmental science, and green industries. He has fostered schoolyard greening efforts among Villanova’s feeder schools, namely St. Joseph and Sacred Heart Elementary. He initiated a butterfly reserve at the high school, inviting students from all levels to learn about butterflies, native plants, and other pollinators. The butterfly reserve has been designated as a ‘Waystation’ by Monarch Watch. Additionally, Andy has established a vegetable garden at Villanova, donating the food to local food banks. Throughout his teaching career, Andy has inspired new generations of environmentalists to care about and take action for the protection and restoration of our environment. Troy Brian is past Chair of the CAW Local 200 Environment Committee, and is a dedicated and tireless champion of our environment. He is the originator of the ‘Art and the Environment’ program with all three Boards of Education. As the In-plant Joint Workplace Environment Committee coordinator, he has been instrumental in recycling and diversion projects that have reduced Ford Motor Company’s costs and contributed to less strain on our environment. He participates annually in the University of Windsor’s human rights forum for Secondary students called “Clean Water as a Human Right”. Troy also worked with the community to develop the natural areas at the Ford Test Track Park through planning and fund raising. Some of our early interactions with Troy were efforts to revive the Yellow Fish Road Program in Windsor. Troy has been a longtime member of the Children’s Water Festival Steering Committee, and is a past Executive Board Member of Computers for Kids. Troy has dedicated countless hours to heightening environmental awareness, conducting watershed clean-ups and tree plantings. At many of these events and activities, he has included his wife and children, promoting and demonstrating that caring for your environment is a family affair. Chris Vilag, now retired, is the past Vice-chair and long time member of Local 200 Environment committee, and the site-wide Environment Representative for Local 200. As the in-plant Joint Workplace Environment Committee Coordinator, Chris participated in waste reduction, worked with the Ford Environment Department to achieve annual improvements in conserving energy and water usage, and heightened employee awareness in a variety of ways. Chris also initiated a 40 hour volunteer program for secondary school students to focus on environmental work, and many environmental organizations in our region have benefitted from this effort. He is a founding member of Computers for Kids and is presently its Executive Board President. For many years, he has been an active member of both the Little River Enhancement Group and the Detroit River Canadian Clean-up. He has attended every single Peche Island Day event to volunteer his time to help people get across to the island. He is a longstanding member of both the Earth Day Committee and the Children’s Water Festival Steering Committee. In fact, at virtually every environmental event held within our region, you will usually find Chris lending a hand in his friendly, helpful, sincere and well-respected way.